Habitat for Humanity homes are near completion on Ash Street. Thursday, March 15 dawned sunny and warm, the air smelling of spring. The warming sand at the Habitat for Humanity build site on Ash Street hinted at the year to come. The parents, Dureti Mohamed and her husband Gumachu Taha wandered about, checking out their new home under construction while their two preschoolers, Nanati and her brother Dursa, quietly played. Progress is obvious everywhere. What was a few foundations late in 2017 now sport not only walls but also windows are going in, Energy Star windows that will cut the operating costs for Ash Street’s newest residents when they move into their own homes later this year. The window installation is courtesy 25 volunteers from Bentall Kennedy, which has also made a $25,000 donation to the project. “Here we are doing wonderful things to help people with their homes,” said Tony Astles, the president of real estate service at Bentall Kennedy. He commented on how it was the first time some of this group of employees, some of whom have been together for 20 to 30 years, had swung a hammer or used a level since they built their own first homes. As a firm, Bentall Kennedy has been in the building and property business in Canada and the U.S. for a long time, and has built many rental homes across Canada, according to Astles. 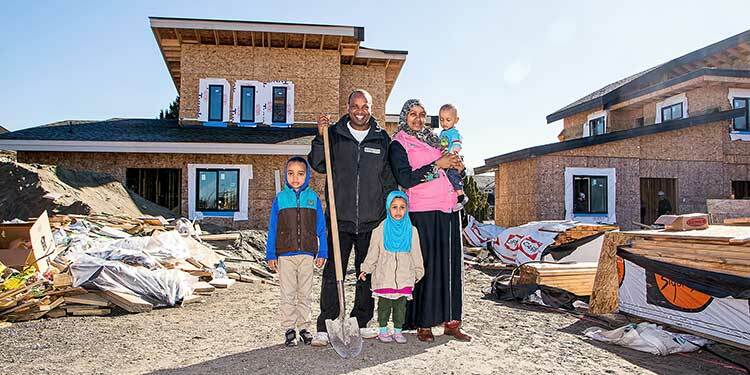 Dennis Coutts, CEO of the greater Vancouver Habitat for Humanity glowed with quiet delight to see the good-natured bustling, the progress and the Taha-Mohamed family enjoying the progress. He spoke of the purpose of Habitat for Humanity—giving people safe, affordable homes, a hand up and not a hand-out because all families are expected to contribute 500 hours of their own time to volunteer for the project as well as make the mortgage payments on their homes. Once the family owns the house, they pay all the taxes on their home as well as making regular payments. If they choose to sell, they must sell back to Habitat for Humanity but will receive their amassed payments, less the property taxes they paid, to carry with them as a down payment on their next home. Gumachu Taha adds his Habitat volunteer time to his full time job as a manager for London Drugs’ Olympic Village store and his time working as an interpreter. In addition, he has just finished his studies at Langara where he earned a certificate in management and business. Taha originally came to Canada as an Ethiopian refugee from a camp in Kenya.